A couple chatting as they ride down the bike lanes. 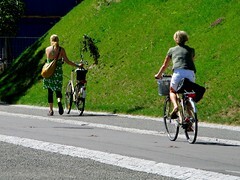 A couple accelerating off the light in true Copenhagen style. That potted plant isn't going to walk home by itself, now is it? 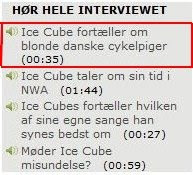 The American rapper Ice Cube performed recently in Denmark and was interviewed for a radio programme. You can hear the snippet of his interview wherein he praises the Danish Cycling Girls. Go here first. Then find the box below and click the text highlighted with red. A popup player - no adverts since its our public service broadcaster Danish Broadcasting - will come up and you can hear 35 seconds of The Man talking about Copenhagen and 'cykelpigerne' or cycling girls.